I didn't really think you could find something better than the Apple brightness tool, yet ScreenShade is significantly more powerful. With this application, you can easily darken your screen completely or make it really bright. The program is accessible from the menu bar and pressing 'toggle ScreenShade' adjusts brightness according to the level of light in the room. Press 'Redetect external monitors' to reset it and get a new brightness level. I wasn't all convinced by the level of light that ScreenShade chose though as most of the time it simply was too dim to work properly. Best is probably to open preferences and set brightness yourself, via the little slider. You'll see you can also select what areas to shade. 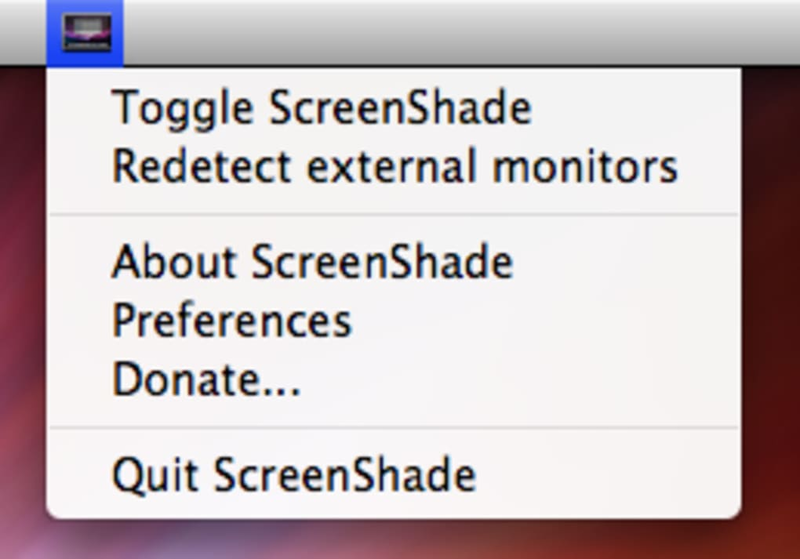 ScreenShade also works very well with two simple shortcuts: Option with plus or minus to adjust it yourself. More powerful than the brightness controls in your Mac, ScreenShade is good to have around if you work in poor lighting conditions. 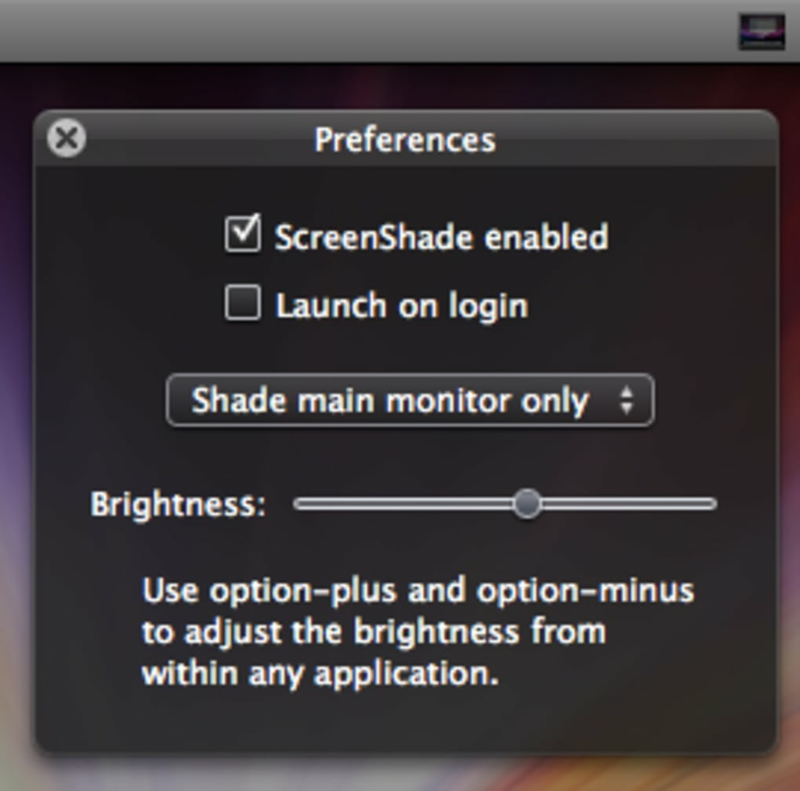 ScreenShade is a tool for further dimming a screen (or screens) past the capabilities of the OS X brightness display settings. This utility is especially useful for people who find themselves using their computer in a low-lighting situation. Even on its lowest native brightness setting, my MacBook Pro's screen is still extremely bright when used in a dark room - ScreenShade to the rescue! Brightness does the same job. This is handy and easy to use application. Even novice user will not encounter any difficulties while using it. You can adjust the screen brightness with the help of little slider. I often sit in front of my mac overnight chatting with my friends overseas. Screen Shade is a good solution when you frequently use your mac in low-lighting situation. However this app is not necessary. Brightness feature in system preferences does almost the same job. A Handy Utility. It's a mystery why Apple insists on us having eye-searingly bright displays by default, in these days of being supposedly eco-friendly. Our iMacs default to full brightness at all times, and the built-in screen dimming is nowhere near sufficient to avoid sore eyes in a domestic environment. ScreenShade, whilst not saving any energy - it doesn't actually reduce backlight brightness; rather it reduces the display drive signal - is a real eye-saver. We no longer have to use eye drops, to alleviate the soreness which is brought on by less than an hour's use of our Macs. On the other hand, our MacBooks can be dimmed to zero with the Apple controls, and so we don't need to use ScreenShade on those boxes. Only one small bug; ScreenShade refuses to start at login, despite setting both Preferences and the 'Open at Login' option on the Dock. Having said that, it's a fairly trivial matter to start the application manually, and the simple keyboard shortcuts allow for easy adjustment of display brightness. For the record, our iMacs are always run with the Apple controls set at minimum brightness, and ScreenShade is then used to further dim the displays down to the required levels. Thanks for providing the software. Handy utility which makes up for the Apple brightness controls deficiencies. Refuses to start at login. Not needed on MacBook or MacBook Pro. What do you think about ScreenShade? Do you recommend it? Why?